This clever, compact Hawaiian bungalow has a tough side. When a client asks David Sands to build a bamboo bungalow, it’s a source of joy for him. Sands’ company, Bamboo Living, specializes in housing made from the island’s fastest-growing and most-durable plant. But one request carried more pride than the others. One of Sands’ own employees wanted one of the stylish tiny shacks as a new home to celebrate her return to the Big Island of Hawaii after 12 years on the mainland. 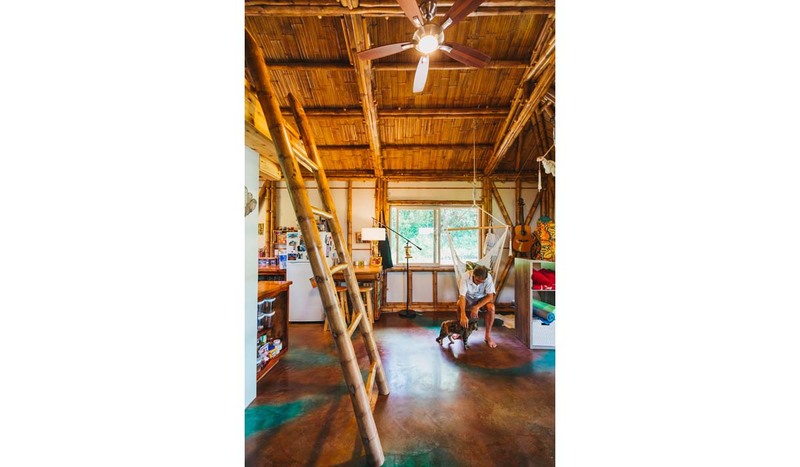 The employee, Bamboo Living’s sales manager, “wanted to live simply in a dwelling that mirrored the beauty and elegance of nature nestled within the tropical landscape of her youth,” says Sands, the company’s co-founder and chief architect. 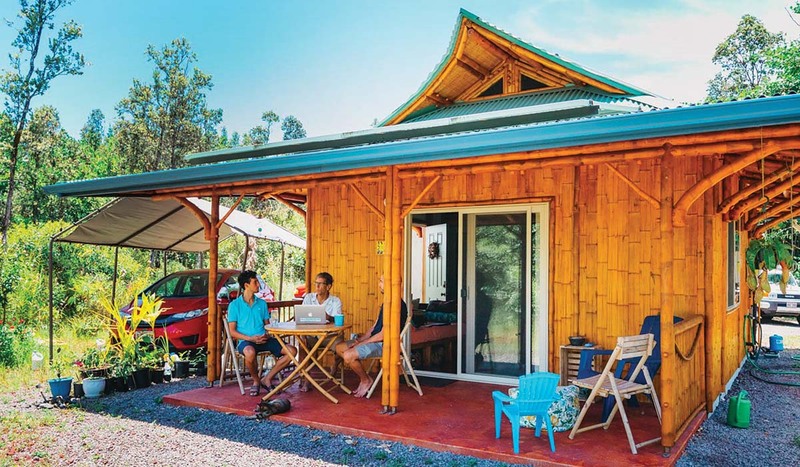 The simplicity comes in a tiny size: The bungalow is a mere 352 square feet on the inside, the smallest dwelling allowed by the local building department. 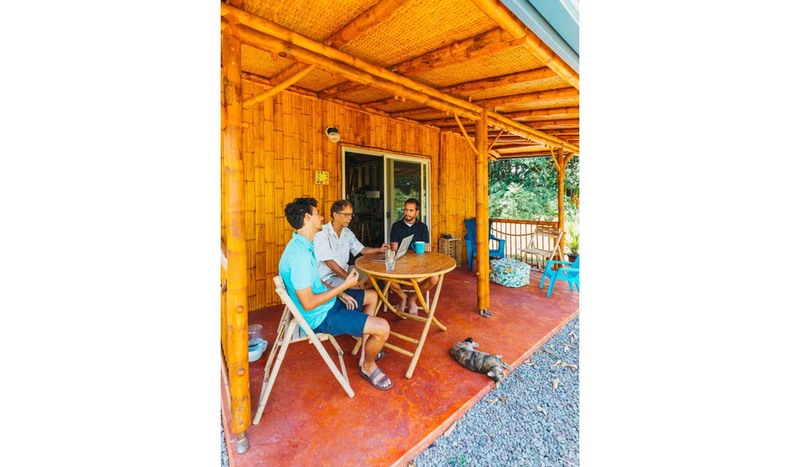 For almost a quarter century, Bamboo Living has made a name for itself by designing and building the first and only structures to use International Code Council (ICC-ES)-approved bamboo. 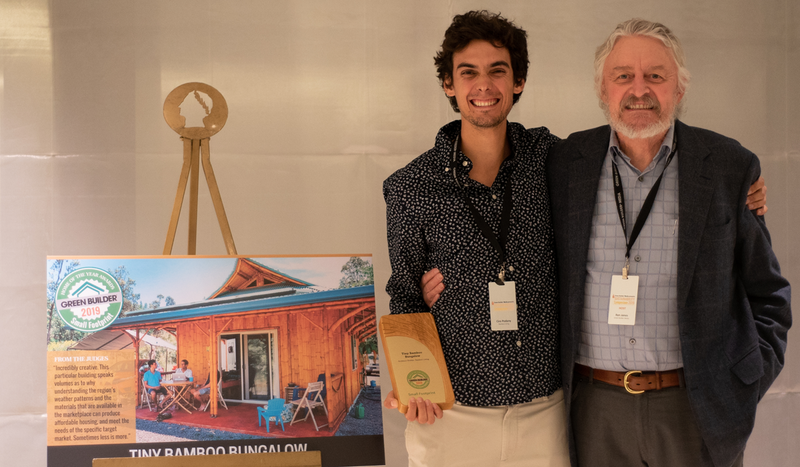 The company calls bamboo construction “green building at its best,” as it aids in the fight against climate change by saving trees and by removing carbon dioxide from the atmosphere, and bamboo stores C02 faster than other trees, thanks to its fast growth rate. 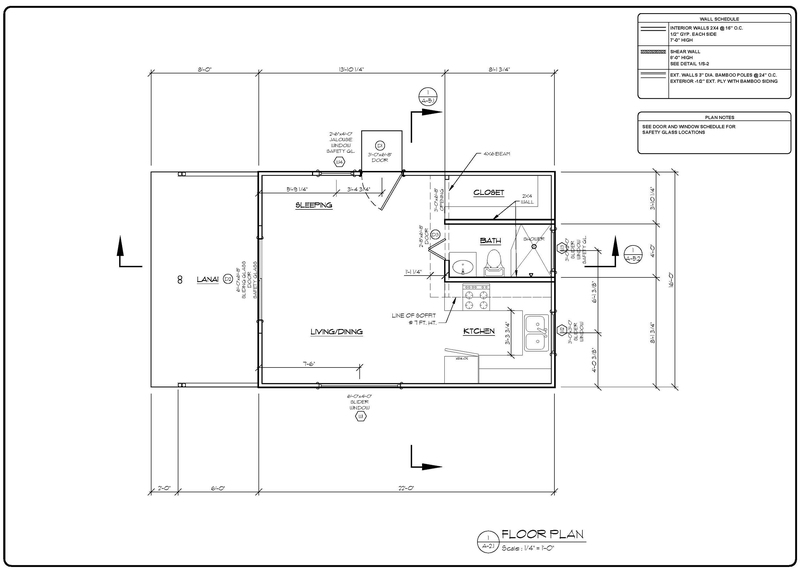 The prefabricated bamboo elements include steel connectors at the joints, that are secured on site with a system of through-bolts. With this structural system, Bamboo Living buildings have withstood multiple hurricanes with winds up to 185 mph. 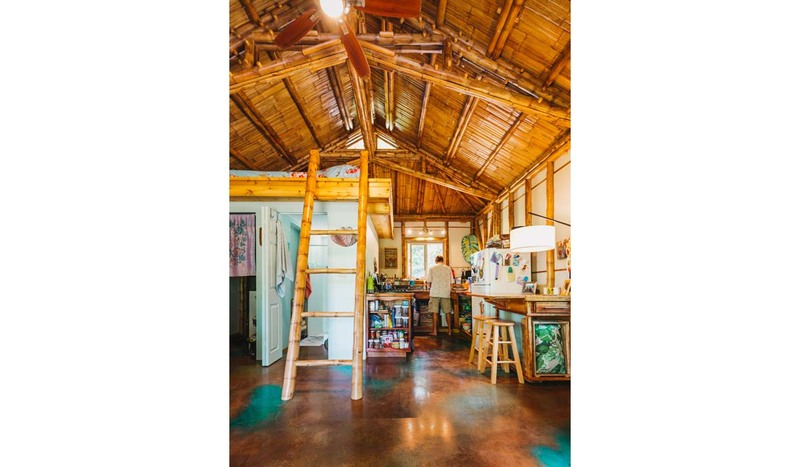 Nicknamed “The Tiny Bamboo Bungalow,” the structure was built with a flying gable roofline, a high ceiling with exposed bamboo trusses, and a lanai with bamboo poles and pickets that blended into the outdoors. The bamboo components of the structure, which include the wall panels, roof structure and porch elements, were produced at Bamboo Living’s factory in Vietnam. After being shipped to Hawaii, a construction crew of six assembled the bamboo home package in just one day. 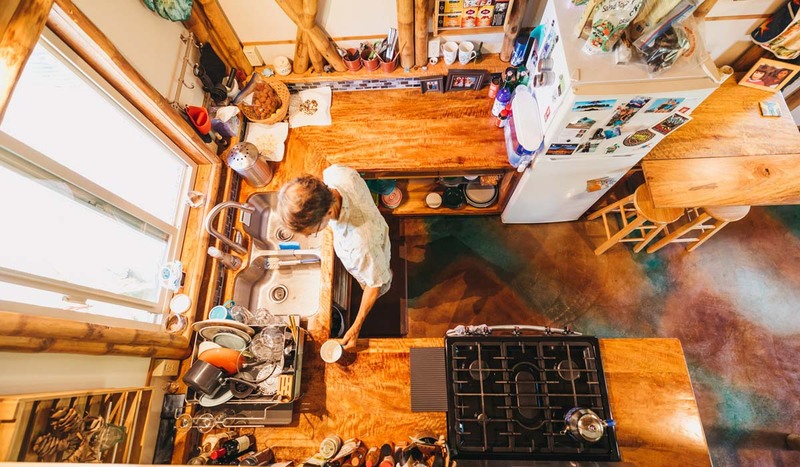 The Tiny Bamboo Bungalow operates completely off-grid. A 6,500-gallon rainwater catchment tank stores and supplies the water. Eight photovoltaic panels capture the power of the sun, and the energy is stored in Blue Ion lithium iron phosphate batteries by Blue Planet Energy. The house is essentially off-grid ready, with propane-powered range and water heater, and no HVAC system. 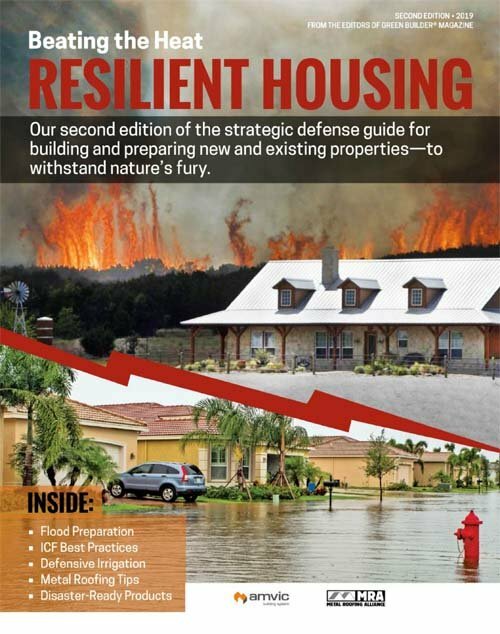 The home has a carbon-negative footprint, both in its construction phase as well as in its built state, generating more power than it consumes. Sands believes bamboo could one day be the thing that takes the state of Hawaii carbon neutral. The plant’s fast growth, he says, would easily make for a constant, easily accessed building material. An earth-toned stained concrete floor adds to the natural beauty of the bungalow’s interior. 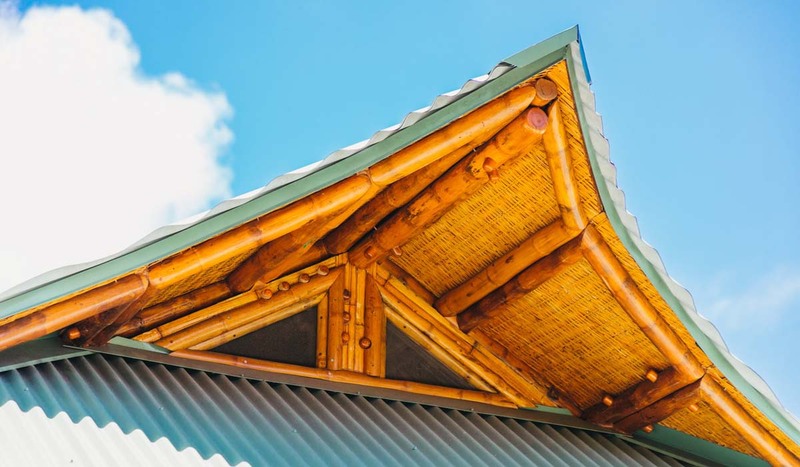 Bamboo makes up most major components in the bungalow, including the roof, woven bamboo ceiling, bamboo railings and a bamboo ladder. The home’s bamboo beams are designed not only to meet fire codes; but also to perform well in earthquakes and hurricanes. Bamboo Living accepts their Best Small Footprint Award at the Sustainability Awards Dinner at Mr. Chow in Caeasars Palace.